Emboss your Company brand-name in gold on the front of the diary and hand out a batch of these wonderful Personalised Letts Diaries and you can't fail. Give Letts Diaries out to your customers for a business gift that will be well received and useful, reminding all your customers of your business details and logo every single day of the year. Contact us about our 2018 Personalised Letts Diaries for a price or sample on 01989 565 281. Quarto size or A4, desk or pocket, a leather Corporate Letts diary with your logo gold blocked on the front is a classy Christmas business gift. So why not make your customers Christmas this year by giving them one of our Letts Diaries. 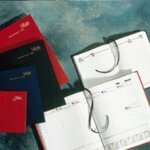 Many more personalised and promotional gifts besides our Letts Diaries click here.